All Soul´s Day, or “little souls”, and Halloween - more and more popular in the Czech Republic - is approaching. 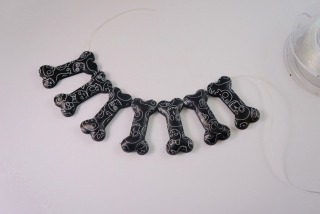 At that occasion I am bringing you a simple idea on how to create a bone bracelet / pendant / necklace / earrings. I drew inspiration during my visit of the Ossuary in Kutná Hora – there is a church decorated by human bones. At first I found it morbid but soon I got used to that idea and I admired the way human bones were arranged into the shape of garlands and other beautiful decorative shapes. 1. 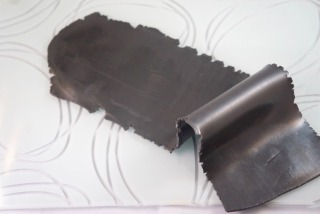 Condition black clay at 2nd thickest setting of your pasta machine and get a sheet. 2. 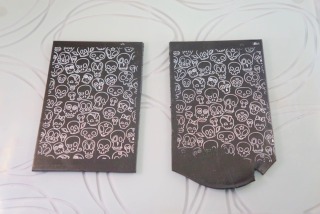 Place the bone silk screen onto the sheet and transfer the design. I have two sheets for a bracelet. If you make earrings or a pendant, one sheet is enough. You get 6 bones from one sheet. 3. Let the acrylic paint dry and condition one more sheet at the thickest (2nd thickest) setting of your pasta machine. When passing the clay through the pasta machine, spread a piece of cloth onto the sheet and get a textured sheet (if the cloth is thin, use 2nd thickest setting of the machine). 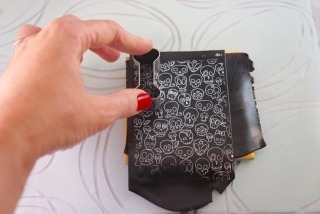 Take the cutter and attach the reverse side of the sheet (the one with the design) to it. By means of your fingers or using a modelling tool gently squeeze the clay into the cutter and make dimples following the shape of the cutter. Do your best in particular at the ends of the bone (i.e. apophyses) so that the shape is not flat. I remember the moment when Donna Kato showed me how to create puffy beads by this technique and I considered it magic. 4. 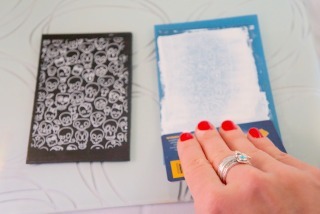 Place the textured side of the sheet to the smooth tile and stick it to the tile with a roller. 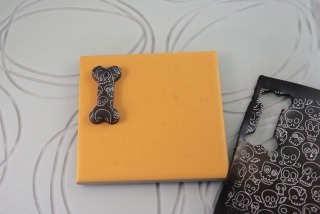 Take the cutter with the squeezed-in clay, place it onto the prepared sheet and cut out a bone. The inner side should remain stuck to the tile. Simply remove the excess clay. 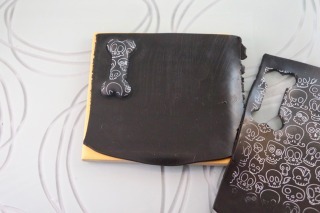 TIP 1: If some clay gets stuck in the cutter (which is my case – this happens due to the texture and the thin shape of the bone, so that´s why the clay does not stick to the tile sufficiently), then heat the cutter with the heat gun and get the clay out. 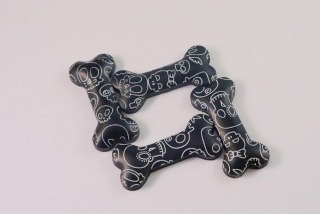 TIP 2: Before baking the bones, pierce their ends with a needle and get small holes for the stretchy bead cord. Bake the clay following the manufacturer´s instructions. If you have used the heat gun, apply a bit of liquid clay to the top side of the bones before baking them (see point 6). 6. Apply a bit of clear liquid to the top side of the bone and bake it again. 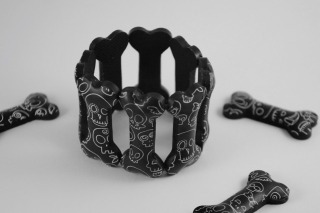 If you are making a bracelet, it is useful to fix the acrylic paint and to prevent scratches on the surface. 7. When the clay gets cool, take a hand drill and drill holes at the indicated spots, or enlarge the diameter of the already pierced holes – it should be a bit larger than the cord / rubber string thickness. 8. If you have a big eye needle for threading beads, pass the cord through the eye of the needle and thread both ends of the bones. Thread all the bones and connect the pieces. If your cord is thick, you can thread the bones without using a needle. 9. Tie a double overhand knot at the end and swing the cord for a while to tighten the knot. 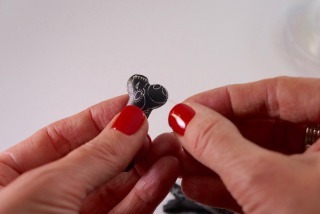 Cut off the excess cord and insert the knot into the bone. And here are some tips how to arrange the bones. This is one of the options how to thread a necklace. 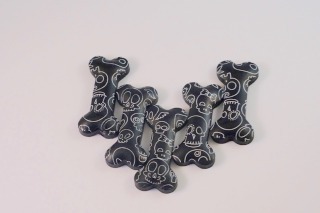 How about a hair clip with three bones?